Here's mine. It's not much but it's all i really use. Location: Califorina, you heard me right. I have a sheet, I made(and by made i mean change stuff a bit) everything below the black line... which isn't much. If you would like to edit it(for your own pourposes, and mainly cause I wish there was more on there) go ahead but send me the edited version. I'm officaly saying it now. Due to me becomeing an MMO addict (Final Fantasy XI) I will be here not often. If you see me you are lucky. BlackMageGirl is a foxy lady. Finally got around to makin' one of these. 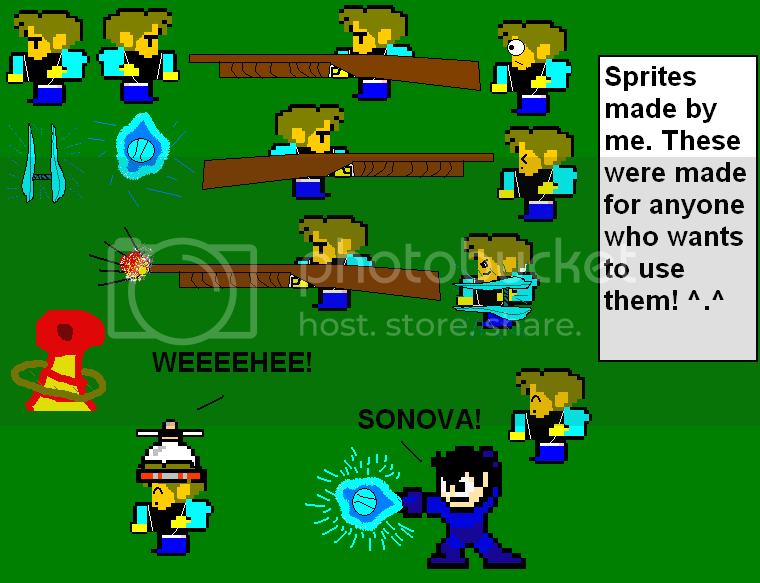 I've always wanted to see myself immortalized in sprite comic form. Hopefully someone will feel like using 'em. Last edited by Viktor Von Russia; 04-01-2005 at 07:22 PM. I feel like posting the sprite sheet I made for my AIM alias, LethargyMan. Here is a sprite I've been making, I'll make a full sheet soon. Right now I just need someone to make the background transparent, I havent figured out how to do that in Elements. After many frustrations with custom-sprite attempts, I decided to just say "to hell with it" and go with this. Didn't stop me from putting my full effort into it, though. Now to make the sheets for the remainder of my characters, and then I can go back into comic-making! Go me! [EDIT]: And now there's the sprite sheet for my dark side. Last edited by Loyal; 04-02-2005 at 05:26 PM. Here is a sprite sheet of my character. I have much more, but I cannot release them for various reasons. I know how it is in its current format but i dont have photo editor to make it gif format. I know bmp=evil. Thanks to MammothTank who created the sprites. The server time is now 10:44:02 PM.